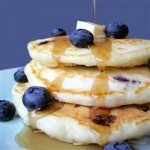 Pancakes with blueberry and maple syrup. A very familliar straightforward flavor. Just delicious. Nicotine Juice ?mg/ml (VG: ?% PG: ?%) ? ? ? Maple Pancake ? ? ?